All forms of expression and extracurricular activity are outlawed, as they are viewed as distractions to a productive lifestyle. Anyone who violates this law is subject to cleansing. Cleansing is a process in which the faulty personality is placed in an isolation room for a duration no less than one hour in order to weaken the subject’s mind. A more efficient personality is subsequently implanted into the offender, allowing them to return to benefit society. Of course, this would never happen to you… or has it? What's the story behind The White Room? You were just apprehended for violating the High Commandments. The punishment: immediate cleansing. Placed inside a high tech isolation room, you have one hour to find your way out before you lose yourself entirely. The longer you spend in The White Room, the more you’ll be leaving behind. 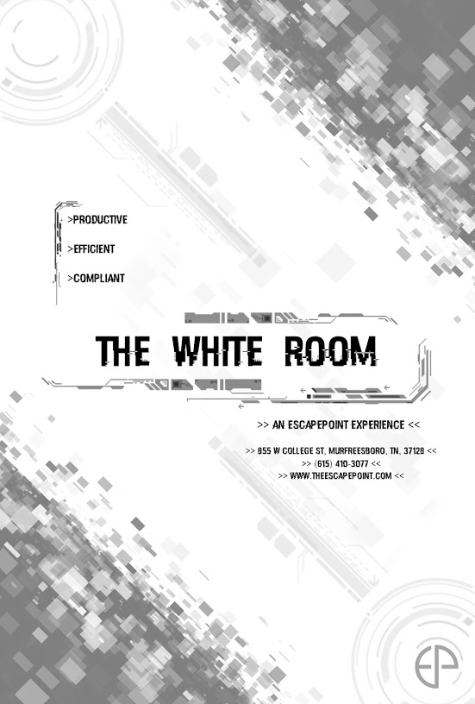 During your time in The White Room, the sensory deprivation may cause you to second guess things. the less you can trust your own thoughts. A new personality will be assigned to you shortly. The White Room is ideal for new and intermediate players. The White Room is designed as simplified linear room, heavy on aesthetic features. This type of room is excellent for new and experienced players alike. Since the crime rate of 2217 is so low, it is unlikely you would be put into holding with more than 5 others. For efficient use of resources, we recommend Cleansing at least two subjects at a time.